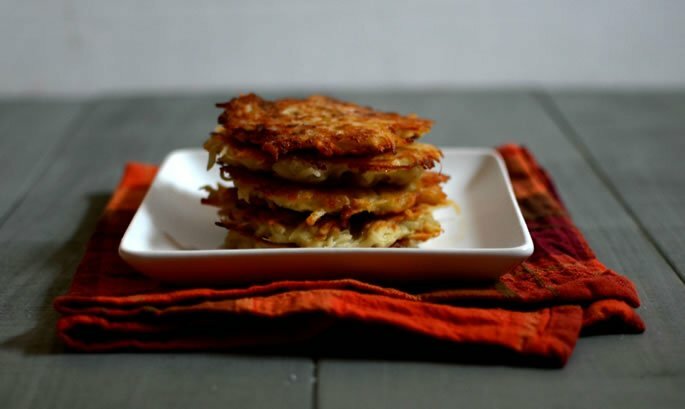 I recently realized that while I've shared my recipes for corn latkes, butternut squash sweet potato latkes, vegetable latkes and beet latkes stuffed with goat cheese, I've never shared my traditional potato recipe. You'll need onion, oil, salt, potatoes, eggs, flour and oil. While the recipe works with any type of potato, using Yukon Gold will be much more aesthetically pleasing because they discolor much more slowly than other potatoes and will keep your mixture looking bright and fresh for longer. They also have a buttery taste which will take your latkes to the next level. 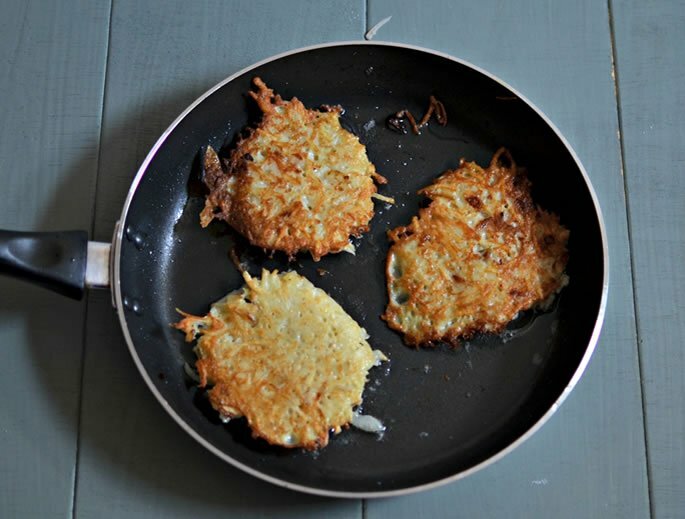 Most latke recipes call for raw onion, but I like to fry them off first to give the latkes more flavor. Dice the onion and sauté it in 2 tbsp. oil and 1 tsp. salt until golden. Peel and grate the potatoes (by hand or with a food processor) and immediately put the potato shreds into a bowl of cold water. Continue shredding until all the potatoes are grated. Place the eggs, flour, fried onion and 2 tsp. salt in a separate bowl. Drain the grated potato well, add it to the rest of the ingredients and mix immediately. Heat 2-4 tbsp. of oil in a frying pan, over medium heat. Test the oil by dropping a tiny bit of the mixture into the pan. When the oil sizzles upon contact, it is ready. TIP: Add a small piece of carrot to the oil you're frying in. When the carrot starts to looks shriveled and brown, replace it with a fresh piece. The carrot helps absorb the burnt taste from the oil, and you can keep frying for longer without changing the oil. 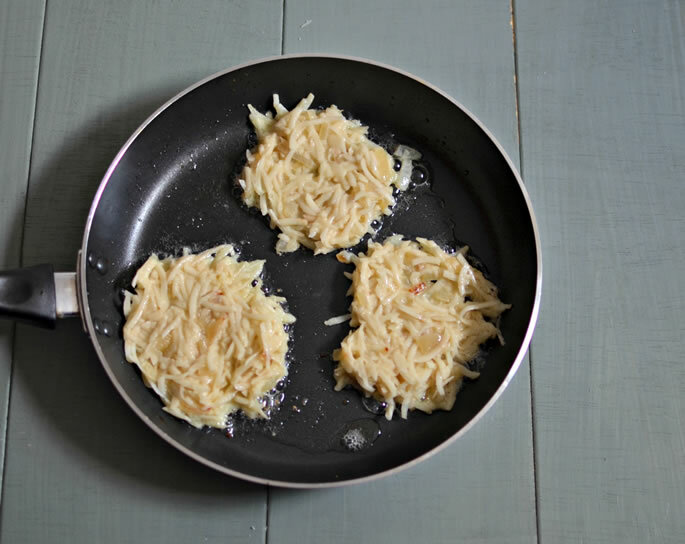 Latkes taste best fresh, but if you need to make them in advance, I recommend reheating them in a frying pan with a tiny bit of oil to help them crisp up again. 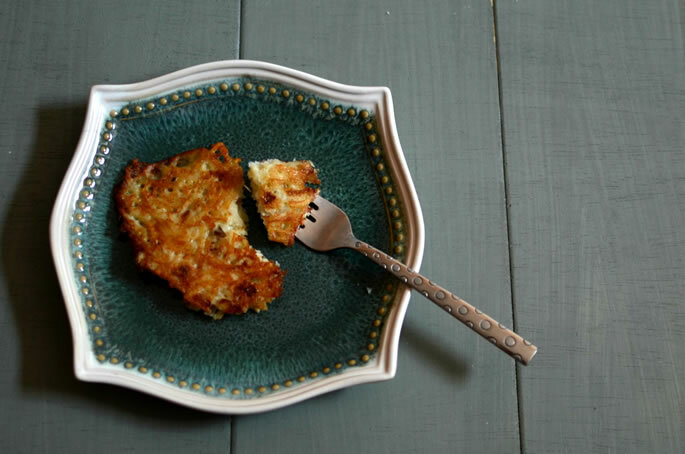 Looking for a gluten free potato latke recipe? Try this one. Dice the onion and sauté it in 2 tbsp. oil and 1 tsp. salt until golden. Grate the potatoes (by hand or in a food processor). Immediately transfer the grated potato to a bowl of cold water. I know some people are staunch apple sauce and sour cream latke-eaters, but I've never really been able to wrap my mind (or taste-buds) around either of those. I prefer my latkes straight up. 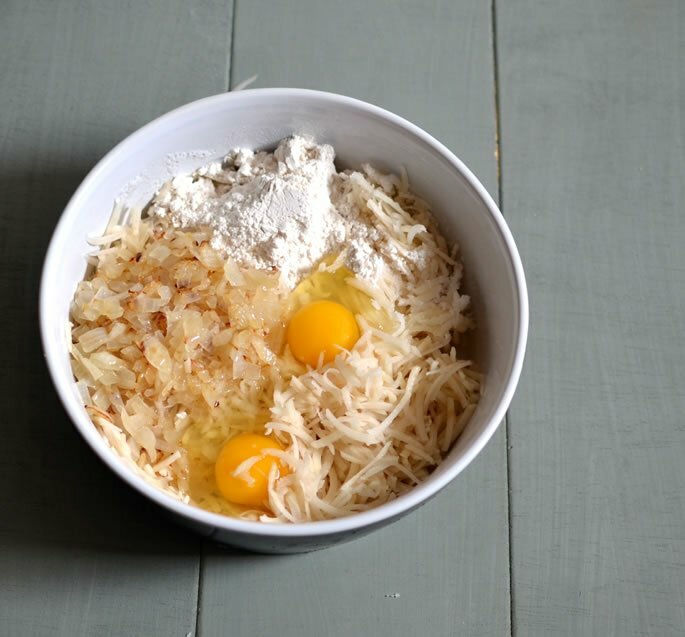 What's your latke condiment of choice? I followed the recipe exactly. The texture was amazing but it came out way too salty. Why would that happen? Can it be because the salt in Israel is different? gluten free correct. this is recipe is not gluten free. Todah rabah! Great tip with the carrot! I initially thought it's about taste. My Jewish ancestors come from Romania, we always add a bit of garlic either into the oil or the food itself.